Videos • Episodes combine family stories with children's storytelling. Richard Sharrah, left, and Randy Roberts star in a scene from the YouTube series "Kid History." 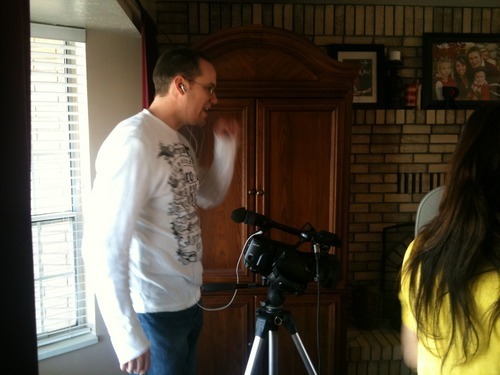 A behind-the-scenes moment in the making of the YouTube sensation, "Kid History." A behind-the-scenes moment in the making of the YouTube sensation, "Kid History." 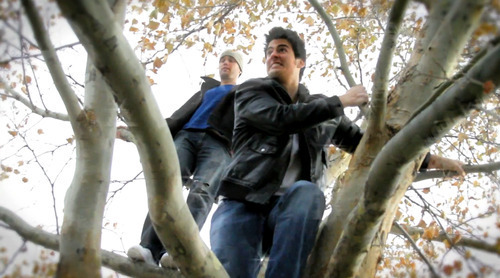 Randy Roberts, left, and Richard Sharrah star in a scene from the YouTube series "Kid History." Randy Roberts, left, and Richard Sharrah star in a scene from the YouTube series "Kid History." John Roberts in a scene from the YouTube series "Kid History." Kids do say the darndest things, especially when you put their words in the mouths of adults. 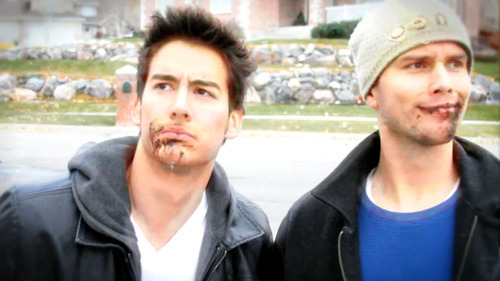 Utah County brothers Randy and Brett Roberts took that idea and have turned it into a series of videos that are becoming a YouTube sensation, especially in family-friendly Utah. "Kid History" is a line of comedy sketches written and directed by the brothers in which they interview their adolescent nieces and nephews about legendary family stories and then recreate those stories on video. They take the audio of the children's interviews and act out the scenes with adult actors  usually the Roberts brothers and friends  mouthing the kids' often nonsensical storytelling. "The stories we keep retelling are the ones that people in the family keep finding amusing," said Randy Roberts, 30, who was studying dentistry at New York University, but plans to move back to Utah next month. "We think if our family keeps cracking up on them, then the world would find they were funny, too." And apparently, they've hit that universal funny bone. "Luv you guys! When I showed it to my mom, she almost died laughing!" raved Brittany Picker on the "Kid History" Facebook page. "They are the kind of videos that you can watch over and over again, and you just CAN'T get sick of them!" Savanah Brooke Larsen posted. While the videos have become popular across the country, the brothers say they seem to resonate more in Utah's Mormon culture. "There's a lot of people who aren't Mormons who really love it," Randy Roberts said. "I have a lot of professors at school who love them and have shared them with their friends. But I feel like the Mormons pass it along a lot more. I feel you have to have kids to really appreciate it, and Mormons have more kids, so maybe that's why." So far, the brothers have posted four episodes since September, with plans to post and premiere their fifth next month. Altogether, their YouTube shorts have received more than 1.3 million views. Yet the Roberts' idea of re-enacting old stories is nothing new on the YouTube circuit. They came up with the idea when Randy Roberts was looking for a new idea for a film to enter in an LDS-themed short-film festival in New York City. He created "Kid History," which was a twist on another hit Web series, "Drunk History." In those comedy shorts on FunnyorDie.com, historical events are recreated with a real drunken narrator. The popular videos have starred such celebrities as Michael Cera ("Scott Pilgrim vs. The World") and John C. Reilly ("Step Brothers"). "I thought 'Drunk History' was hilarious," Randy Roberts said. "I thought, 'What would be a Mormon-appropriate, funny version of "Drunk History"?' "
The first episode relates the oft-told Roberts family story in which two of the brothers were stalked by an angry motorist. For the video, they turned to several of their 27 nieces and nephews to retell the story on camera, then filmed the kids' version. That included all of the youngsters' tangents about Barbie dolls or their own made-up versions of the story. "It takes a couple of hours to shoot all the kids," said Brett Roberts, 39, a Lindon entrepreneur who also owns a video-production company. "It takes six to seven hours to shoot all the adults, and then about a billion hours to edit all of it." After that first episode took first place at the short-film festival (Randy Roberts was awarded gym memberships and a trophy), the brothers filmed more episodes whenever Randy returned to Utah for holiday breaks. And there's been a small taste of fame for the brothers, too. "Whenever we go back to Utah, people are flagging us down," Randy Roberts said. In addition, a friend who acted in one of the shorts was recognized in Colorado. They've also gotten calls from a satellite-dish company interested in their videos, as well as from KBYU, the PBS station based at Brigham Young University. "But we're not super-interested in doing a TV show at this point, because we're just doing this in our spare time," Brett Roberts said. "We have other things going on, like family stuff." For now, they plan to keep the videos as a family hobby, as it serves as a chance to hang out with their siblings. 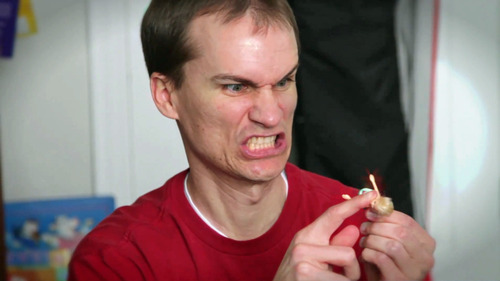 "How we entertain each other really shows up in these videos," Brett Roberts added. "If it got to a point where it was a job and it became less fun, that might take away from it." What • The fifth episode of the "Kid History" YouTube series will premiere at a special two-hour event on Thursday, June 23 at the Covey Center for the Arts, 425 W. Center St., Provo. Also • Members of the cast will be available for a Q&A, and they will show behind-the-scenes footage and outtakes. Tickets • $5 for the main floor, $3 for mezzanine and balcony seats, at http://www.coveycenter.org.